There are tons of great happy hours around town...many of which are largely unknown. For the first of what will become an ongoing series, I will highlight Via Vite's great happy hour. First of all, Via Vite's happy hour is EVERY day and lasts from 3-6 (I was told 7pm by our waitress the other week). Unfortunately they don't offer any draft selections, but they do serve Christian Moerlein's OTR Ale. 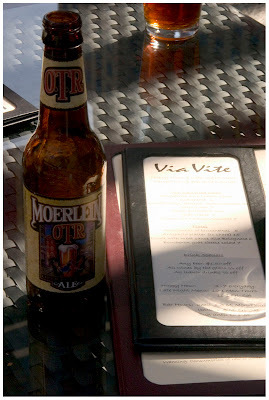 After you take the $1.50 off you'll be enjoying some great OTR Ale for $2 on Via Vite's rooftop terrace. The rooftop terrace is what really makes Via Vite special. It sits directly on Fountain Square and makes for one of the best happy hour environments around. Plus the rooftop terrace consists of couches arranged in a way that is great for groups of up to around 6 people. The food specials also make it a great spot to start off your evening downtown. The wood fired pizzas are great for sharing with a friend and are at a great happy price - $7. If you're in the mood for a great happy hour today then be sure to check out Via Vite. The location is to die for and the food and drink live up to the high expectations. View pictures from Via Vite's rooftop terrace HERE! Mixed Review: On 11/23/08 I had set up a dinner reservation for a party of 12 for a Holiday work gathering on 12/13/08. Prior to our arrival I called only to find out that our reservations for a private area had been cancelled in favor of a larger party who had called after me and wanted the entire upstairs. I was told we no reservation since we were now listed as cancelled. The hostess did make the best of it by squeezing us into a table setting that was in the middle of the restaurant without very much room. Better to have had what we got than to have been sent out into the streets looking for a table for 12 at 6pm on a Saturday. Be cautious when making a reservation here. The dinning experience was marginal as the servers and support staff didn't see the need to ever remove used appetizer, salad, and side plates as well as used glasses, unless we stacked them up and asked the staff to remove the dishes. The food presentations were good, but our table had mixed reviews on the quality and value of our food. If a manager was present, he or she did not make themselves noticeable. It was as if there was no direction at all with any of the staff. Triage at the Blue Wisp tonight!